I find kids love hearing stories from when I was a kid, even the most reluctant talker ends up engaging in conversations like these. 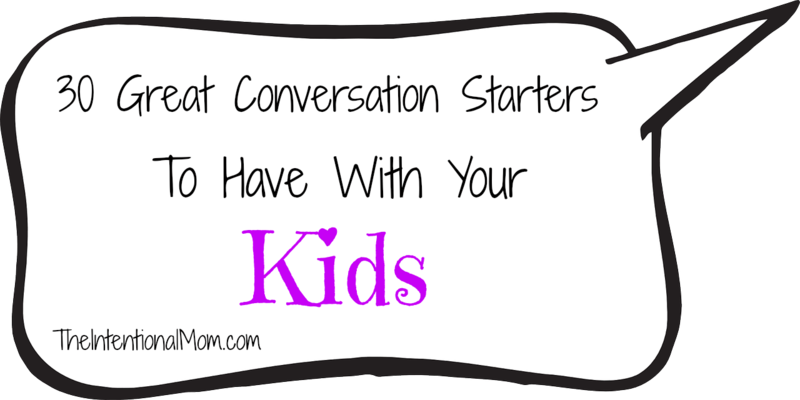 Choose one, choose them all, but these are a great way to get the conversations going! 1. When I was a kid my best friend was ____________. What made them my best friend was the way he/she_____________________. What do you look for in a friend? 2. When I was a kid what I loved about summer was________________. What do you love about summer? 3. What I love about fall is_____________. What do you love about fall? 4. What I love about winter is____________. What do you love about winter? 5. What I love about spring is______. What do you love about spring? 6. What I love about summer is_________.What do you love about summer? 7. My proudest moment in elementary school was_________. What are you most proud of during those years? 8. My proudest moment in high school was_________? What are you most proud of during your older years? 9. My favorite school subject was________. What is your favorite school subject? 10. The subject I hated in school was___________. What is your hardest subject? 11. In one word friends would describe me as_________. How would your friends describe you? 12. The best memory I have of spending time with my mom while I was growing up is the time we_________. What is one way you would love to make a memory with me? 13. The best memory I have of spending time with my dad while I was growing up is the time we______________. What is one way you would love to make a memory with your dad? 14. The best memory I have of spending time with my siblings while I was growing up was the time we________. What is one thing you would love to do with your siblings to make a memory? 15. My favorite family vacation was___________. If we could take a family vacation anywhere, where would it be? 16. When I was in first grade I thought I would grow up to be a_________. What was your dream job in first grade? 17. When I was a kid my favorite place to be, my special place was_____________. Where is your special place? 18. My favorite ice cream flavor is__________. What’s yours? 19. A food I used to hate but that I now love is____________. What food have you learned to like? 20. My most embarrassing moment has been when___________. What’s yours? 21. My favorite book of all time is____________. What’s your favorite book? 22. My favorite thing to do in my free time when I was a kid was_______.How do you like to spend your free time? 23. The first time I accomplished something that I never thought I could do was when I________. What would you love to accomplish that seems out of reach to you now? 24. Three things I can still hear my mom tell me are__________. What are three things I have told you that stick in your head even now? 25. Three things I can still hear my dad tell me are__________. What are three things dad has told you that stick in your head even now? 26. My favorite place to visit is__________. What is your favorite place? 27. The worst job I ever had was______ because________. What has been the worst job you have ever had to do? 28. The first movie I remember ever seeing was________. What is the first movie you remember seeing? 29. The most embarrassing thing my mom ever did was________. What have I done that has embarrassed you? 30. The most embarrassing thing my dad ever did was______? What has dad done that has embarrassed you? The next time you have a few moments to spend with your child, try going through these questions and learn a bit more about each other.